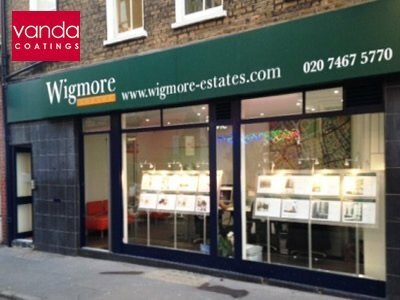 The shop front framework of Wigmore Estate Agents in London was bare aluminium, but it was a couple of years old and starting to look a little dilapidated. The solution for protecting the shop front and to improve its appearance was aluminium spraying which we were happy to do. A new coating of paint on metalwork extends its life by many years if the substrate is prepared properly and the finish is applied professionally. 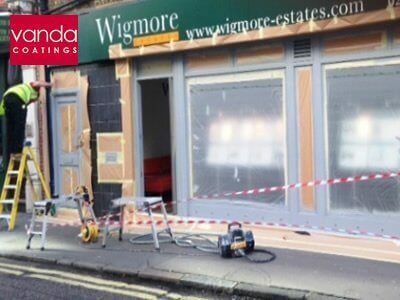 This was a fully functional estate agents, on a main street, so the first thing to think about was health and safety which is why the Vanda professionals cordoned off the shop front from the public. Before masking up adjacent areas to protect them, our team keyed the surface using a hand sanding machine with a strong grit sandpaper. The aluminium needed to be adequately ‘scratched’ before applying the etch primer in order for this layer to stick to it properly. Only then will the final topcoat be durable as well as smooth. After this process of abrasion, the surrounding brickwork, glass and pavement was masked off with plastic, paper and tape. Then the shop front was washed down with standard thinners which also de-greased it. This is important because any grease and grime would prevent the primer and paint from adhering to the aluminium. Just to make sure there were no stray particles of dust or dirt on the framework, our Vanda team blew the surface with the air hose from the HVLP (High Volume Low Pressure) spray gun. A final wipe down with thinners removed any residual grease leaving the shop front in a fit state to prime. Our operatives are certainly thorough in their preparation! The grey etch primer can be seen in the bottom right photo with some of the surfaces having been masked off. Once this aluminium spraying had been completed and left to dry our Vanda team leader spray painted the top coat on to the shop front. After the paint was dry all that had to be done to clean up after de-masking and the excellent result is shown in the top right photo.